In fact, the 3s by Young started a 15-0 run by Clarksville High, with the Wildcats holding the Green Wave scoreless from the 5:22 mark of the first quarter until 5:55 of the second quarter – a total span of 7:22 – before Devonte Williams scored for Gallatin to make it 19-11 CHS. The Green Wave (19-12) would get their offense untracked over the next 2:31 and cut the Wildcats lead down to five points, 25-20, with 3:24 left in the first half following a bucket by Ladarius House. But Clarksville High would close out the first half by outscoring the Green Wave 9-2 over the final 3:05 of the second quarter – with all nine coming from the free throw stripe – to take a 34-22 advantage into intermission. The second half would see Young hit his third three of the game to get things started, but Gallatin scored nine of the next 11 points scored – including five straight by House – to make it an eight-point game, 39-31, with 4:44 left in the third quarter. Again, Young would step up hitting two more 3s to spark a 13-2 run by Clarksville High, as they took control of the game by taking a 19-point advantage 52-33, with 49 seconds left in the period. The final quarter was pretty much a foregone conclusion for both teams, with Gallatin never getting any closer than 17 points of the Wildcats over the final eight minutes, while Clarksville High built its lead out to as many as 24 points, before coming away with the 22-point victory. JJ Jones would add 18 points for the Wildcats, while Avery Bates came off the bench to score 10 points. With the victory, Clarksville High now advances to the Region 5-AAA semifinals at Mt. Juliet High School at 4:30pm, where they will face the number-one seed out of District 9-AAA Station Camp High School – which defeated Northeast High School 61-52 in their region semifinal matchup. 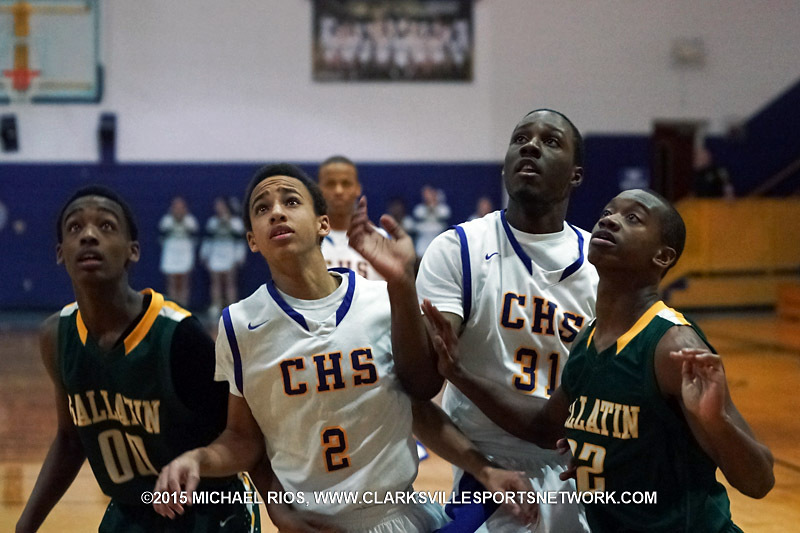 The Wildcats and Station Camp met back on November 21st, with the Bison defeating Clarksville High, 85-65. Marlon Mitchell 2, Ladarius House 15, DeDarius Redding 9, Adam Neelly 10, Devonte Williams 10, Hunter Mincey 2. Team totals 20 6-8 48. JJ Jones 18, Tyriek Cheatham 3, Teal Young 23, Avery Bates 10, Tariq Silver 8, Chris Trice 2, Cameron Stiff 6. Team totals 24 15-26 70. 3-point field goals: Gallatin 2 (Williams 2), Clarksville High 7 (Young 5, Silver 2). Records: Gallatin 19-12, Clarksville High 15-11.